If you’ve ever taken a moment to investigate your shampoo bottle, pill organizer, or Tic-Tac box, you may have noticed the thin, flexible piece of plastic connecting these containers to their lids. This often-overlooked component is the living hinge, an innovation that helped boost plastic’s popularity and versatility. In the broadest sense, “plastic” simply denotes a material’s capacity to be molded. Such materials have been in use for centuries: as early as 1600BCE, Mesoamericans transformed natural rubber into balls, bands, and figurines; since then, materials such as horn, wax, and resin were processed and used for a variety of applications. The consumer plastics industry emerged in the mid-nineteenth century but exploded in the twentieth, which witnessed the proliferation of plastic goods, including Earl S. Tupper’s Tupperware, Mattel’s Barbie Doll, and Mod-style PVC go-go boots and jackets, among others. The advent of polypropylene plastic (PP) in the 1950s ultimately led Enjay (now ExxonMobil) engineers to develop the living hinge: they realized that at a certain thickness, PP could be bent perpendicular to its long polymer molecules, resulting in a “living” hinge that could be bent and unbent innumerable times without breaking. In the same period, increased use of injection molding enabled companies to manufacture single-piece plastic objects whose separate components were connected by living hinges, thereby reducing production costs and minimizing assembly time. At mid-century, iconic character lunchbox reigned supreme. 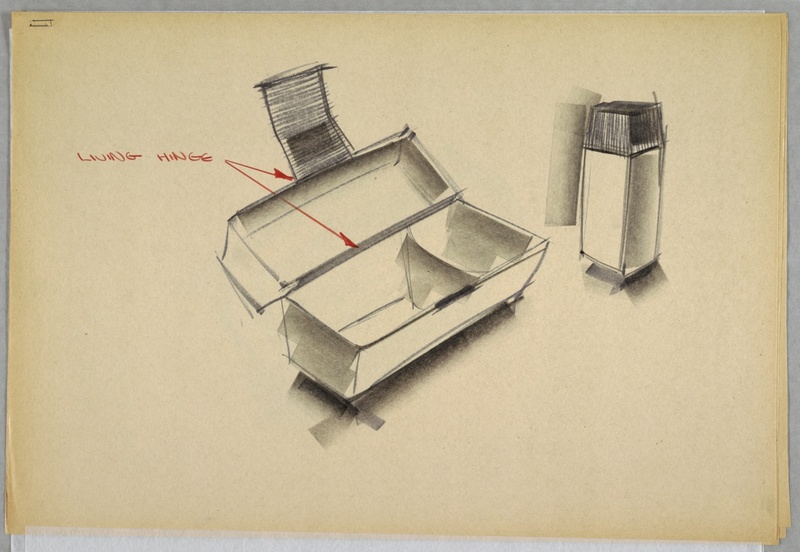 However, in the early 1960s, Donald Deskey Associates produced a design for a plastic lunchbox (c. 1963) for Union Carbide’s Consumer Products Division that foreshadowed the eventual shift from metal to plastic lunchboxes in the 1980s–a shift made possible, in part, by the living hinge. Designed by Earl Hoyt, the lunchbox features a trapezoidal volume with divided food compartments, and a deep lid with a ridged clasp to secure a matching insulated bottle. Both the lid and the bottle lock would pivot open via living hinges. For Union Carbide, this meant streamlined production and assembly, since the object could be made as a single, blow-molded unit; for consumers, the all-in-one product would be stain- and odor-resistant, easy to clean, and available in a variety of colors. It’s easy to understand how plastic’s ultra-versatility propelled its popularity and positioned it as one of the most commonly used materials on the planet. It goes without saying, though, that this dependency has dire consequences that require urgent attention: a recent study revealed that of the 8.3 billion metric tons of plastic produced in the world’s history, only 9% has been recycled; the remainder has wound up in landfills, the landscape, or the ocean. As we take stock of this global crisis of consumption, it’s clear we can’t just write plastic off. It’s worth considering, then, the ways in which design innovations such as the nearly inexhaustible living hinge can prolong the lifespan of the plastics we use every day, inspire their creative reuse, and reroute these products away from landfills and the natural landscape. Rachel Hunnicutt is a graduate student of History of Design and Curatorial Studies at Parsons School of Design|Cooper Hewitt, Smithsonian Design Museum, and the Donald Deskey Cataloguer in the Drawings, Prints & Graphic Design Department. Anthony L. Andrady and Mike A. Neal, “Applications and Societal Benefits of Plastics,” Philosophical Transactions of the Royal Society B: Biological Sciences 364, no. 1526 (July 2009): https://doi.org/10.1098/rstb.2008.0304. In 1839, American Charles Goodyear developed a process by which rubber was mixed with sulfur at a high temperature (vulcanization) resulting in a material that could withstand heat and cold (think Goodyear tires, pencil erasers, and bouncy balls). The same year, the German apothecary Eduard Simon discovered polystyrene by distilling the resin of the American sweetgum tree (think packing peanuts, Solo cups, and plastic cutlery). Annie Groer, “The Ultimately Collection of Classic Lunch Boxes: When Superman Went to School,” The Washington Post, April 25, 2004, http://www.lunchboxmuseum.com/article5.htm . Plastic eventually replaced more conventional materials like cloth, wood, and metal, all of which were previously deployed to carry midday meals to and from work or school. In the nineteenth century, lower-class commuters wrapped their midday meals in handkerchiefs, while upper-class roving repasts were housed in wood boxes. Meanwhile, the tin lunch pail became the go-to lunch parcel both for industrial workers and schoolchildren. Lisa Bramen, “The History of the Lunchbox,” Smithsonian.com, August 21, 2012, https://www.smithsonianmag.com/arts-culture/the-history-of-the-lunch-box-98329938/. And off the planet: Neil Armstrong’s spacesuit, in the collection of the National Air and Space Museum, was constructed from twenty-one layers of different plastics. For further reading, see XiaoZhi Lim, “These Cultural Treasures Are Made of Plastic. Now They’re Falling Apart,” New York Times, August 28, 2018, https://www.nytimes.com/2018/08/28/science/plastics-preservation-getty.html. Laura Parker, “Planet or Plastic?” National Geographic, December 20, 2018, https://news.nationalgeographic.com/2017/07/plastic-produced-recycling-waste-ocean-trash-debris-environment/.